I have been wanting to write about this, but thought that sharing it nearer “three kings day” or Epiphany would make more sense. You know we believe in following the liturgical customs that keep the Christmastide alive, so writing about a seasonal book after the 25th is not me being “late” with this timely review. I hope you haven’t packed up your creche sets yet! The wise guys. Hmmm. Mentioned only briefly in the gospel of Matthew. What more can be said? What sort of historical traditions are there in speaking about their journey to the Christ child? What did the earliest church say about them? A book has just come out that is really, really fascinating, even if it doesn’t shed much serious light on the actual Biblical text. I suspect it is pure legend, but as pure legend goes, it may be important. 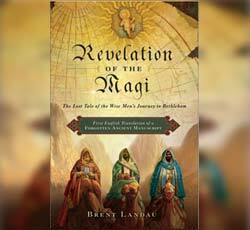 The Revelation of the Magi: The Lost Tale of the Wise Men’s Journey to Bethlehem, as the cover boldly puts it, is the first English translation of a “forgotten ancient manuscript” Brent Landau, a specialist in ancient biblical languages and literature, has given us a great gift in unearthing and translating it all, after doing extraordinary literary detective work in the Vatican Library archives–set on his own far journey by a mere mention in an academic journal and obscure footnote or two. After the existing manuscript was copied down at the Zuqnin monastery in southeastern Turkey by an anonymous monk at the end of the eighth century, it changed hands at some point and was kept in a monastery in the Egyptian desert. There it stayed until the eighteenth century, when G.S. Assemani, collecting manuscripts on behalf of the Vatican Library, brought it to Rome, where it resides today. So we know it was copied in the 8th century, in Turkey. It appears it was cited, by the way, by a monk writing a commentary on Matthew in the fifth century, so it seems to have been written at least that early. The Syriac custom of referring to the Holy Spirit in feminine grammar was popular in the second through fourth centuries, and Revelation of the Magi does this, so it is almost certain it has an early dating, perhaps as early as the third century. Well, I’m not so sure; no, rather, I am sure: it isn’t theologically orthodox, or Biblically-faithful, so it doesn’t have the depth of true truth. We do not recommend extrapolating new doctrinal insight from these sorts of things. It is apocryphal, to say the least. Still, we sure can say that it is a fascinating document, it came from somewhere, and those that wrote it were doing something, saying something about what they wanted said about their interpretation of the Nativity. Is what they said important? Is it a window into some sort of window…? Please, if this sort of thing frightens you, I’d say don’t read it, or, better, read it and learn a bit about fictional stories told in the first centuries of Christmas stories. If Christian origins intrigue you, this might be a fun book to have. The forward itself is a good reminder of the fact of ancient monks who traded tales and wrote amazing stuff, kept in Egyptian faith communities, or in places like Syria. For what it is worth, here is a fascinating review of it by a scholar and reviewer who can do a much better job than I. I do disagree with his assertion that the forward wasn’t helpful: I enjoyed it immensely and learned again, in a few quick pages, how close linguistic readings of rare texts can be understood and how this theological/literary detective work happens. I do love the way he gets at this—suggesting it can function as Midrash. Here is a free download of the great electric guitar version of We Three Kings by one of the best guitar players in the world, Phil Keaggy. Enjoy! The Syriac background of the text with the star descending as a luminous Jesus corresponds with the prominent theme of luminous clothing. Pseudo-Macarius who I’m writing about (from Syro-Mesopotamia in the late 4t…h c.) says that Adam and Eve were clothed in robes of glory and light, but these were stolen by Satan at the Fall. Eventually, humans will receive these garments of light again because of Jesus’ incarnation, death and resurrection. The Holy Spirit as feminine/Mother is found in early Syriac texts, but disappears after the 5th century I believe. While this text and others like it might not become central to our faith and practice, they do serve as a great source of reflection on the mysteries of the Christian faith. Although Ps-Mac writes in Greek, I’ve had the opportunity to begin studying Syriac and have been introduced to many interesting Syriac texts. One aspect that really draws me in is that theological concepts are not presented as straightforward statements but rather as mysteries with depths that beckon for continued exploration and wonder. For anyone interested in reading about these themes, check out http://www.marquette.edu/maqom, the website for an ongoing seminar on the Jewish Roots of Eastern Christianity. You’ll find articles on luminous clothing, Ps-Macarius, Adam/Noah/Enoch traditions, liturgy, prayer, and many other related topics, as well as extensive bibliographies. 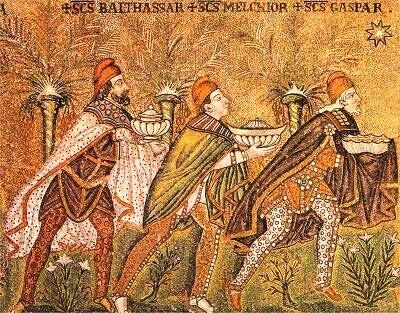 I’m a daft little screwball, but I decided to read into the story of the Magi a little more. From what makes the most sense to me, I figure that the Magi were Zoroastrians. They were astrologers from the East. Where better than Persia, the hotbed of Zoroastrianism in the day? It’s probably a little bit of an assumption based on my limited resources. Thanks Joshua—I’ll click over to your wacky little site right away. I appreciate your reading, and sharing. By the way, I don’t think your too daft, here, because I think this is one pretty wide-spread scholarly assumption. Makes sense. This odd tale that has recently been put into English suggests otherwise, some place even more usual and faraway, but it is construed as fantasy/fiction. Or so it seems. It’s pretty amazing to think that there were storytellers playing with the story already in those early years. Some might be scared by that, others find it a perfectly human way of working out the implications of the true texts. Kinda like those targum’s Walsh does so well. Keep on, my friend. Glad we cross paths sometimes! May I heartily recommend a book entitled “The Bible and Astronomy: The Magi and The Star in the Gospel”, written by Gustav Teres, SJ. (Solum Forlag: Oslo, 2002. The first part of the book gives a detailed textual analysis, including a look at original text that corrects the misunderstandings of astronomical phenomena wrongly interpreted and translated in the gospel account of the Bethlehem star. The work is also immensely respectful of Babylonian astronomy, and, as well as the heartening detail, gives a model of cross-cultural dialogue that is exemplary in its handling of the material. The second part of the books presents short sections concerning various other astronomical phenomena and related issues. The whole book is deeply informative, being written by an astronomer-priest, who is able to bring astronomy and faith issues into intelligent and insightful relationship.